The vision: floating, autonomous city-states to bring about a social “Cambrian explosion”—without taxes or pesky regulators. We’re sitting in the sleek lounge of San Francisco’s Infinity Towers around a granite coffee table inexplicably stacked with unopened cans of wild sardines: one reporter and a handful of adherents to obscure political philosophies, flirting over cocktails. We have come here for the opening mixer of the third-ever conference of the Seasteading Institute, a think tank funded by Silicon Valley tech gurus—Snow Crash fans, apparently—who envision floating city-states as incubators for alternative models of governance. “Seasteading is a common cause for many ideologies,” the institute’s website explains, in a statement that could be interpreted as either boast or caveat. “There’s no nonperjorative term for what I am,” MH is telling the man across the table, whose T-shirt is emblazoned with the libertarian equation: Taxation = Slavery. Herrick had just pegged MH as “Hobbesian,” but he says he harbors more admiration for Robert Filmer, a 17th-century English political philosopher who defended the divine rights of kings. Raison d’être: Founded by Ernest Hemingway’s brother, Leicester, under the Guano Islands Act of 1856. Economy based on stamps honoring Churchill, Hubert Humphrey, and LBJ. Raison d’être: Vanity project of Prince Roy Bates of Sealand. Sells royal titles and has been suggested as a data haven for the likes of WikiLeaks. Raison d’être: Speaking Esperanto, printing stamps, possibly tax evasion. Blown up by the Italian navy. Raison d’être: Libertarian utopia, minting gold coins. Invaded by Tonga. Raison d’être: Laissez-faire capitalist paradise. “In Oceania the sharks and barnacles will be in the sea, not on your property!” Never got off the drawing board. Founded in 2008 with seed money from PayPal founder Peter Thiel, a prominent backer of the Ron Paul Revolution, the Seasteading Institute combines a hacker’s approach to government with a Waterworld-esque conception of Manifest Destiny. More than a mere repository for political dreamers, it brings together engineers, scientists, and entrepreneurs of the sort one often finds in the Bay Area: techtopians who might be brilliant or delusional—or both. 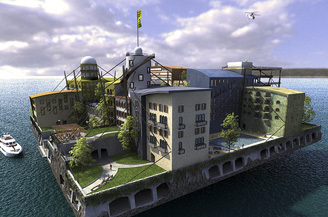 Of course, before anyone can emigrate to any of these floating utopias, somebody needs to figure out how to build them. The institute has created the Poseidon Award, which it hopes, by 2015, to bestow upon the founder of the world’s first seastead that hosts at least 50 full-time residents, is financially self-sufficient and politically autonomous, and is willing to offer its real estate on the open market. Petrie is of the opinion that investors could create a seastead in international waters off the West Coast—perhaps using a repurposed offshore oil-drilling platform—for roughly $300 per square foot, about what housing costs in San Francisco. He favors a modular approach, “basically an at-sea trailer park,” though an anonymous donor recently gave the institute an $8 million, 275-foot gambling boat anchored in Florida. At the table is Peter Burchhardt, a former program manager for Microsoft, who wants to know why Blueseed doesn’t market itself to tech companies in, say, Germany, as a way to offer workers a tax dodge. “We have been approached,” Mutabdzija admits, but Blueseed’s focus on start-ups is more politically palatable. In the afternoon, after a Duke University student schools us on on nonlethal ways to repel pirates—LRAD sound cannons, high-pressure hoses, fortified “citadel rooms”—the lib-tech flotsam turns to the question of whether seasteads will be allowed to claim sovereignty. Myron Nordquist, associate director of the Center for Oceans Law and Policy at the University of Virginia, recounts a 1970s visit from the crown prince of Tonga during his past life as a State Department official. The prince, who had arrived in DC sporting a top hat and a monocle, wanted to know if the United States would protect a group of American libertarians who, to the monarchy’s chagrin, had built their own micronation, the “Republic of Minerva,” on an artificial island close by. “We don’t protect anyone, especially if they are American,” Nordquist recalls telling him. Thus emboldened, Tonga commissioned a New Zealand tugboat and stormed Minerva with an invading army that included a few palace guards and a four-piece band. The libertarians pulled up stakes, and the abandoned island has since disintegrated back into the sea. The day ends with a “lightning round” of presentations by entrepreneurs who envision using seasteads to farm fish, grow algae for biofuel, outsource government services, and breed genetically engineered superorganisms. Needing a refill on champagne, I head for the bar, where 15-year-old Mason Garard has just ordered a glass of ginger ale. Known around Indianapolis’ North Central High School as “Mr. President” (or so he says), Garard is an enthusiastic student of alternative political systems, especially those involving ships, booty, and hardtack. “Pirates had complex systems of government that were revolutionary,” he explains as the Merlot passes beneath the erector-set skeleton of the Bay Bridge. Garard fancies himself a liberal, and he seems particularly enthralled with how some pirate bands operated as communes, dividing their spoils equally. As the cruise continues, a tongue of fog unrolls from the mouth of the Bay, slathering the Merlot in Pacific damp. In the white-tablecloth dining room, I sit down to a plate of prime rib across from a scruffy man wearing a bandanna decorated with pirate skulls. He’s chatting with Ryan William Nohea Garcia—a Hawaiian who somehow reminds me of Keanu Reeves—about how Star Trek creator Gene Roddenberry supposedly named Captain Kirk after Captain Cook, the 18th century oceanic explorer. “Seasteading is about as close as you can get to living in the sociopolitical future,” Garcia says. Chief engineer Petrie, clad in a tux with leopard-print bow tie, chimes in with a disquisition on the potential benefits of using seasteads to harvest energy from electricity-producing seaweed. Entrepreneurs hope to use seasteads to farm fish, grow biofuel, and outsource government services, not to mention escape taxes and regulations. 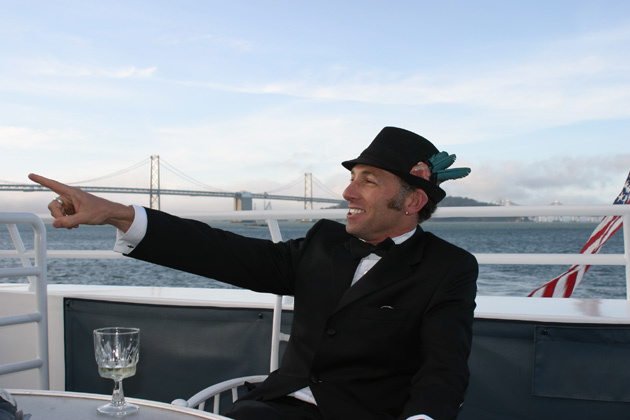 Christopher Philip, a renewable energy entrepreneur clad in a blazer and Tevas, joins us just in time to point out that nearby Angel Island was once considered as a potential home for the United Nations—which, after all, was conceived in San Francisco before being stolen by New York.